Choosing a pet bird is not a difficult task, but you first need to know if a bird is the right pet for you and your family. A pet bird can be a wonderful and exciting addition to any family. 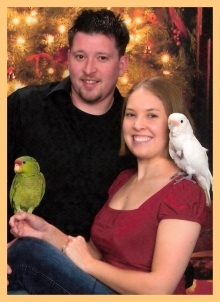 However, it’s important to realize that pet birds are a very big commitment. It’s important to think long and hard about whether or not you are ready and willing to bring a pet bird into your home. Take as long as you need because, as the saying goes, “Most cats have nine lives, but most parrots have nine homes.” This is sad, but very very true. Many pet birds land in bird rescues around the country because their owners didn’t fully understand that bird ownership is a lifelong commitment. How much money do you have in your budget for caring for a bird? Birds cost money, even if you get a pet bird for free. You need to consider not only the cost of the bird, but the cost of a cage, food, toys, veterinary care, nail trimming and wing clipping procedures, and whatever else your bird needs. Some of these costs come up on a daily, weekly, monthly, and annual basis. You also need to keep in mind that you may need to replace toys more often than you think. Some of the larger parrots can go through a $20 toy in a few hours. How much time do you have to devote to caring for a bird? Everyday, birds need their cages cleaned and their food prepared as well as time spent with you (they are naturally “flock” animals). A single pet bird will need about 15 minutes in the morning and evening for food preparation (at the least). You also need to spend about 30 minutes in the morning and at least 30 minutes to an hour in the evening providing your bird with play and cuddle time outside of his cage. Add to this about 15 minutes of cleaning the water and food bowls and changing out the cage paper. Every week, you’ll also need to spend about 30 minutes to an hour cleaning and disinfecting your bird’s cage. The time it takes depends on the size of your bird’s cage. Yes, birds do require a very high time commitment. This is a bit easier if you work from home, but if not, you will need to be prepared to spend a lot of your time at home caring for and spending time with your pet bird. Time commitment becomes even more serious with birds such as Cockatoos. They would love to be surgically attached to you and if they don’t receive the care and time with you that they need, screaming and feather plucking is almost inevitable. How much time do you spend away from home every day? If you spend a lot of time away from home, then a parrot might not be the right pet for you. They need daily interaction and the proper amount of care. Do you go on a lot of vacations? Without even thinking about the amount of time your bird will be without you, have you thought about who will take care of your bird when you leave? You can’t just leave enough food or water–they may be knocked over and your bird may die a horribly slow death from starvation. If you do have someone to care for you bird, are they comfortable handling him? Even though you’re gone, your bird still needs his necessary daily interaction. Birds can fit into a home with children and other pets, but there is some planning involved before choosing a pet bird. There needs to be enough room for their cage and playstand in the busiest part of your home (birds need to be a part of the action). Birds also rely on instinct and may bit. Young children can hurt some of the smaller birds while larger birds can do a lot of damage to children with their large beaks. Children need to be taught to respect the pets in the household and also need to be supervised whenever a parrot is around. Older children can be great with pet birds; just don’t rely on them to take proper care of the bird. You also need to take other pets into consideration. Even a small bite from a dog or cat can be deadly to a bird. You need to be prepared to supervise whenever your bird is out of his cage. If you have another bird in the household, it’s important to know that even though some birds get along, most do not. Supervision is always important. Are there noise restrictions where you live? Some pet birds can be very, VERY loud. If you live in an apartment there are many parrots that you shouldn’t keep as pets. There are birds that are OK for apartment living, but you need to make sure that that is the type of bird you choose when choosing a pet bird. This becomes a bit easier with our quiz, which we will discuss later. If you’ve never owned a pet bird, then you may need to start out with one of the smaller species to get the hang of it. This isn’t something to be taken lightly. Birds are huge commitments and I’m sure that you don’t want to add to the already out-of-hand bird rescue problem. Make sure that you absolutely know what you are getting into before choosing a pet bird. Do you or anyone in your family have allergies? Some pet birds are powder birds that have powder down on their feathers that create dust when they preen. These birds include Cockatoos, Cockatiels, and African Greys. They may cause allergic reactions, so you need to take this into consideration before choosing a pet bird with powder down. Are you ok with having your furniture damaged? Birds love to chew. They don’t care what they chew on, they just like to destroy it. If you have a lot of valuable furniture in your home, you may want to reconsider choosing a pet bird that is a larger parrot if you don’t want to see your furniture damaged. But even small birds can make tiny holes in your blinds and curtains. Birds make a mess. The larger the bird, the bigger the mess. Seed, feathers, and even bird droppings are usually all over the place. Neat freaks tend to have a difficult time with the mess that pet birds can make. If you want a bird for a companion that will be as loyal as any dog could be, then a pet bird might be the right pet for you. If you want a bird because you think he would look great in your living room, then you need to reconsider. Canaries and Finches can spend a lot of time in their cages, but parrots cannot be kept in a cage and ignored. They are “flock” animals and in your home, you will be his flock. Your parrot requires daily interaction with you or problem behaviors such as screaming and feather plucking might develop. If you are choosing a pet bird that can talk, then you need to realize that talking depends on each individual bird. Even the most talkative bird species have individual birds that don’t talk at all. How long can you care for a bird? Birds can live to 60 years or more, so you need to consider the lifelong commitment it takes to care for pet birds. Have you thought of what you might do if your bird outlives you? Choosing a pet bird with a longer lifespan means a longer commitment is required from you. As you can see, there are a lot of things you need to take into consideration before choosing a pet bird and bringing one into your life. The video below is a great video that might help you fully understand what bird ownership is like. Exotic birds are truly amazing creatures. However, many of these beautiful birds are being left to rescues because many new bird owners don’t know what they’re getting themselves into. Parrots are a lot of work and demand a lot of your time…for decades. This is a great video that may help you understand why owning a parrot turns out to be too much to handle for many bird owners. If, after all of this, you have determined that a pet bird would be the right pet for you and your family (and your neighbors! 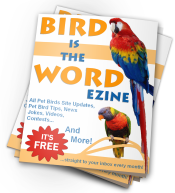 ), then we highly recommend you take our What is the best pet bird for you? quiz before choosing a pet bird. This quiz will help you determine what is the best pet bird for you based on your lifestyle and what you’re looking for.